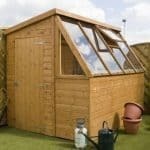 Large storage sheds can cost a small fortune, but this one is available at a ridiculously low cost. 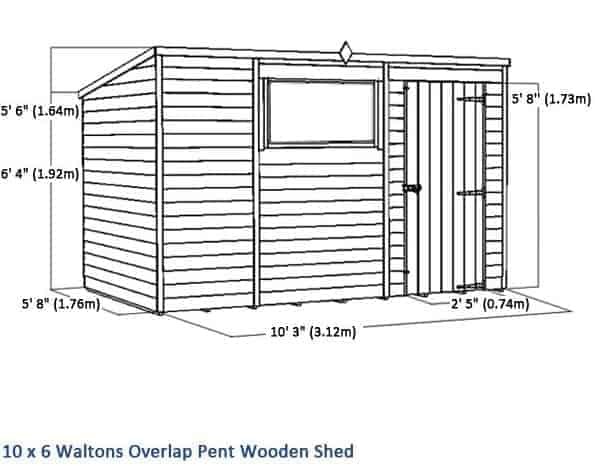 Offering a very generous amount of space, this pent shed is part of the Waltons value range, yet it comes with some excellent features. It features a large, wide, well braced door and a styrene glazed rectangular window. The building has been created with general, light-weight storage in mind. The floor and the roof are made with solid sheet materials, helping to cut costs whilst still providing sturdy support. A butterfly catch is installed on the door, allowing you to make sure that it stays shut when not in use. A heavy duty sand felt is added to the roof to back up its natural water resistant qualities. Sloping down towards the rear of the shed, the pent roof makes the shed ideal for gardens with any height restrictions. For example, it can easily be installed under trees, unlike apex roof buildings. 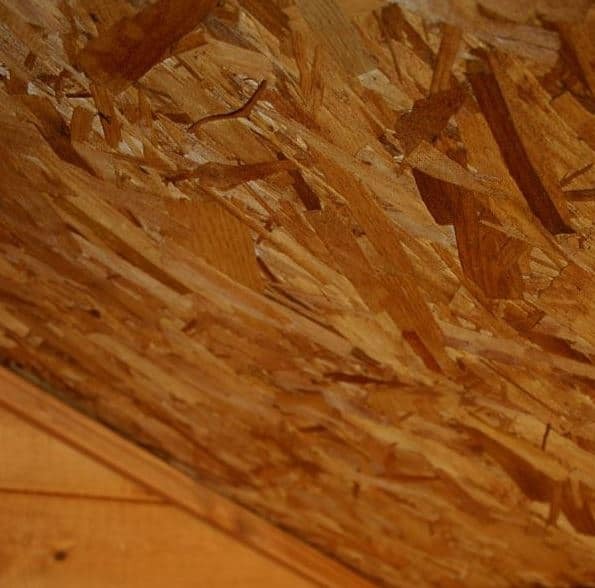 A 10 year anti rot warranty is provided, though you do need to maintain the shed annually to benefit from this. The walls have been constructed with 8mm overlap cladding. Whilst this does not support the weight of interior shelving, Waltons do have a range of standalone shelving sets you can benefit from. For the price you pay for the shed, it offers truly exceptional value. Solid sheet materials will not support heavyweight storage. A free 28mm floor support pack is included with the shed to rectify this and an extra strength support pack is also available. This is a pretty basic wooden storage shed which has largely been designed with value in mind. Although you can strengthen the floor and increase its usage capabilities, we’d still recommend purely using this as a storage area. There are stronger similar size buildings available that would be better used as a workshop or home office. You need to think that the amount of money you would need to spend to turn this into a solid workshop would be the same amount as what you’d spend on a slightly better quality specifically designed workshop. With pent style sheds of this size, you’ll typically find they tend to be wider than they are in depth. This one is no exception, but what is different is the height of the building. Apex style roofs are more known for their tall design, whilst pent sheds are known for their space-saving benefits. 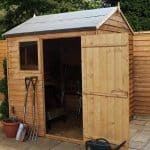 However, this unique shed combines the best of both worlds, offering an impressively tall design, whilst still allowing you to assemble it under low tree branches, or in front of other buildings and fences. The door comes with standard measurements that you’ll find on most sheds and it provides brilliant access into the building. The shed boasts a sloping pent roof, providing great protection against rainwater and offering more flexibility in terms of where it can be installed. Waltons have covered it with sand felt, a heavy duty type of covering that helps to protect not just against water, but falling debris too. It is created with 8mm solid sheet board, which if we’re honest does feel pretty weak. However, a few joists will solve this problem. The floor is a little thicker at 10mm, but we are disappointed that it is created with solid sheet materials. Considering it is a value overlap shed however, this isn’t a surprise. All overlap sheds come with solid sheet materials as that is how the manufacturers keep their costs down. What it means for you is that you’ll only be able to store very light items. The good news however is that you are provided with a free 28mm floor support pack. Consisting of slightly thicker joists, you just slide these into position next to the standard joists on the shed’s floor. This will strengthen it so that you can store medium weight equipment and tools. For heavyweight storage, we highly recommend the extra strength support pack available as an extra. As with all budget sheds, this one is manufactured from overlap cladding. Out of the modern cladding types used, overlap is the weakest and the cheapest. However, that doesn’t mean you are getting a low quality building. Overlap is still reliable and provides a good level of protection against the UK weather. All it means is you need to maintain it a little more to ensure it lasts. The stand out feature of overlap is its rough, fence-panel design. The boards are installed a little over the top of one another, which is where it gets its name. You’ll find it has a more authentic and rustic design as the panels aren’t planed. However, the downside to this is that there is a risk of splinters. So if you have young children this is something you’ll have to watch out for. Another thing you really need to be aware of is that overlap cladding is susceptible to warping. As it doesn’t come with an expansion gap like the tongue and groove clad sheds do, the structure of the building could get damaged if changes in the wood were to occur. So prevention is the best thing you can aim for. 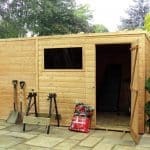 Erecting the shed in a shady part of the garden will limit the chance of the wood warping due to direct sunlight. It’s good to see that although the walls aren’t as durable as tongue and groove, the interior of the shed features the exact same framing as thicker clad buildings. Waltons use 28mm x 28mm framing. They have also added double framing to the shed’s corners. This doesn’t just boost rigidity; it also helps to prevent moisture build up. You may save costs on the initial purchase price with overlap sheds, but you do need to spend money on annual treatments. It isn’t as weather-resistant as tongue and groove so it is very important to top up its treatments every year. We’d also say it is equally important to use a more expensive spirit treatment rather than a water based variety. These work by penetrating into the actual timber and forming two barriers. The first is on the surface of the timber, just like water based treatments, but the second is a deeper interior protective barrier. On more expensive, thicker clad sheds spirit treatments are used because they don’t require annual re-application. However, with this overlap shed we really do advise that you reapply the treatment every year no matter which type you choose. We should point out that you are given a free 5L tub of Golden brown treatment. This is a resin enriched water treatment and it adds a stylish coloured finish. You can either use this alone, or you can apply it over a spirit treatment for maximum protection. The shed is supplied with a 10 year anti rot guarantee, but this only applies if you use a spirit based treatment annually. One of the things that has surprised us with this pent shed is the design of the door. It’s common to see a single door on Waltons pent sheds of this size. However, as it is built from value materials, we found it a pleasant surprise that the manufacturer has included a braced door design. Most value buildings come with a ledge door but they are very rarely braced. So this can be seen as a stand out feature of this model. So what does braced actually mean? Well basically it makes the door stronger, adding additional support to prevent it from sagging. So no matter how much you use it, you should find the door remain strong and intact for years to come. There is a fairly large rectangular window included on the building. The thing we like about this is that it provides light into the shed, helping you to see what you are looking for without the need for artificial light. We also think it gives the building a more attractive design. It’s worth noting that this is a fixed window so it won’t provide any ventilation. It’s often said that you get what you pay for and sadly this is true in terms of security and privacy. 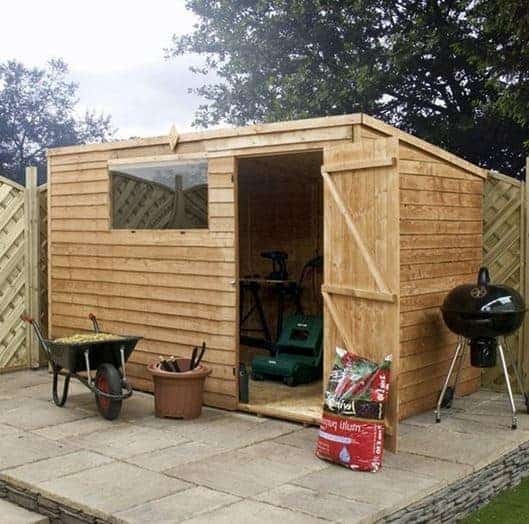 Ideally we’d recommend this shed for gardens that are naturally private and secure. This is because the door doesn’t come with a lock and the cladding itself isn’t overly strong. So it wouldn’t cause too many problems for somebody who did decide they wanted to break in. It’s advertised as coming with a turn button lock. Now for those unfamiliar with the numerous shed locks out there, it’s a safe assumption that this would lock the door. It doesn’t. It is also commonly known as a butterfly catch and its sole purpose is to keep the doors shut, not locked. So if security is high on your priority list, you will need to invest in a separate lock. The window also eliminates any privacy you may want. With tongue and groove clad buildings you can solve this problem by adding curtains, netting or a blind. 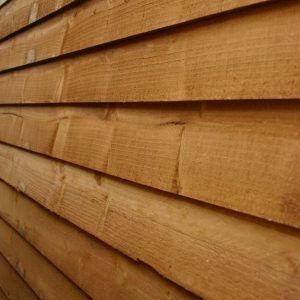 However, we wouldn’t recommend trying that with this overlap shed as the cladding isn’t thick enough to support anything being nailed into it, or anything heavy. That’s why we recommend this shed for gardens which aren’t open to the public. We’d also suggest covering anything of value so it can’t be seen if somebody does break into the garden. On the plus side, it is created with 2.5mm styrene glazing. 100% shatterproof, these types of windows are known to be not only safer than single glazing, but also tougher too. 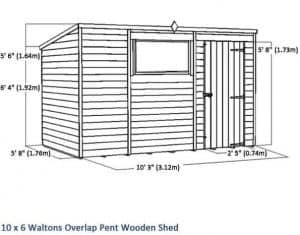 Waltons give you three ways to alter the shed and they are the same three options as you get with most sheds in the range. The one we feel you’ll benefit the most from is the extra strength floor support pack. This offers a drastic increase on the current 10mm solid sheet floor and makes it possible for you to store heavier equipment. Although the company does give you a free slightly thinner 28mm support pack, the extra strength version is highly recommended. It doesn’t cost that much extra, yet it provides you with ultimate peace of mind. It also increases the possibilities of what the shed can be used for. With the solid sheet materials alone, it is only really ideal as a basic storage facility. However, with the tougher floor you could turn the shed into a home office or even a workshop. Treatments provide another easy way to customise the building. If you don’t really like the natural finish, you can opt for one of many coloured treatments available. Another free gift supplied with the shed is a Golden Brown treatment. Sticking with this will obviously save you money. However, you could also choose from colours such as Evergreen Green, Cedar Red and Country Cream. All of the treatments available are water based so if you’re going to be using a spirit based treatment, you could apply these coloured water ones on top. That way you benefit from both the tough, thorough protection of the spirit treatment, along with the coloured benefits of the water varieties. Your last option is to upgrade from heavy duty to superior duty felt. In our opinion this is definitely worth doing. On close inspection, you’ll notice the heavy duty felt has a pretty thin design. It is also prone to perish; particularly in harsh weather conditions. We’re confident it will provide plenty of protection for the first year, but after that you’ll likely need to upgrade anyway. The superior duty felt is available in olive green and charcoal and it is built from very tough fibreglass. Self-adhesive, it is very easy to fit and it offers a thick, textured design that looks really attractive. As well as the customisation possibilities, you also have a choice of extras which can help enhance the shed. In our view, the Draper accessories are the least useful. If you’re planning on turning the shed into a workshop, the cordless rotary drill and spirit level set may prove useful. However, whilst Draper is a leading manufacturer of DIY tools and equipment, we don’t feel they are a necessity that you absolutely need to buy. What we do recommend on the other hand is the shelving sets. Overlap cladding is great for saving money, but it doesn’t provide enough strength for you to hang shelves or hooks from its walls. That’s why these useful shelving sets have been created. The standalone units are made with 16mm tongue and groove and they offer either two or three tiers. They are also on offer in 3ft, 4ft and 5ft lengths. So you have the potential to really add to the amount of storage available. Finally there’s the padlock. This 49mm weatherproof padlock does come armed with some pretty incredible features. For example, it is covered with a unique Thermoplastic weatherproof jacket. It also benefits from double locking. 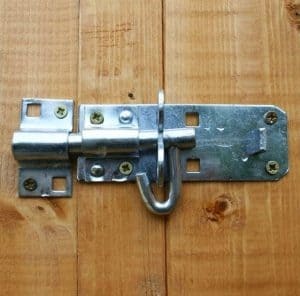 So by fitting this onto the shed you will be massively improving its security. Despite being created with value in mind, you are still provided with a good quality, reliable shed. The materials may not be as strong as tongue and groove, but they are more than adequate to support lighter storage. This is a reliable building, but it is prone to warping. Regular, annual treatments will help to lengthen its lifespan and you can also upgrade the roof and floor to further boost its longevity. As sold, the shed does offer a large, spacious interior. However, the strength of the floor only allows you to store light equipment. You will need to upgrade if you want to store anything remotely heavy. You also can’t install shelving, though there are standalone shelving sets on offer which can help increase the storage space once you’ve upgraded the floor. One of the advantages of overlap cladding is that it isn’t as heavy as tongue and groove. Therefore it makes the building much easier to erect. Waltons also supply you with everything you need to install the shed. As it is a large sized building, it will still take at least half a day to install. 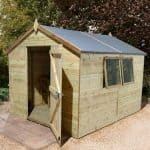 This simplistic shed provides fantastic value for money. It still benefits from a few great features and the cost of upgrading isn’t expensive. 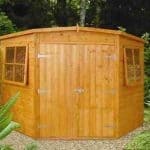 So if you just need a general, basic storage facility, this is one of the most affordable sheds available. Final Thoughts: If you require a large storage shed but you don’t have a large budget, this overlap pent shed is a good choice. 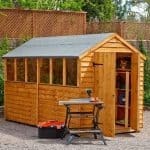 It’s one of the more basic sheds available from Walton’s and we’d recommend it only for use as a storage facility rather than a workshop or home office. We like that it comes with heavy duty roofing felt, a braced door and a styrene glazed window. However, we do feel it is important to upgrade the floor. It may not be the most impressive building available, but it does come with some pretty decent features. Overall it offers great value for money and the free treatment and floor support pack help to add to its value.